The Battle of Nashville, Dec. 15, 1864. 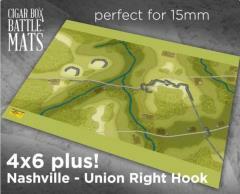 Re-fight the intense action at Hood's redoubts along the Hillsboro Pike during the battle of Nashville! This scenario mat is part of the Osprey Games officially licensed range of "Across A Deadly Field" terrain mats. This is the same fantastic artwork found in the "ADF - The War in the West" scenario book. It features all of the artwork from the ADF scenario book, including: steams, redoubts, roads (1/2 inch wide), fences, buildings, etc. Just add your troops and start playing! This scenario represents the situation on the battlefield at 1pm on Dec. 15th, with the CSA left flank under Gen. Hood being furiously assaulted by the Federals under Gen. George Thomas. How will your command fare in a re-fight? This mat is will fold up into a backpack and is easily transportable to your local club or hobby shop! Just put out on the table, smooth out by hand, and add your troops and additional terrain! This mat will provide you and your friends hours of gaming excitement. This mat is also usable generically for other periods like: NAP, FIW, AWI, 1812, etc. 4x6 plus - approx. 56"x76"